Science may not seem like the most outgoing of disciplines, but take it from us - a science party is always a killer party! Maybe it's because they're eager to cut loose after being hunkered down in the lab all day, or maybe the sceintific mind is genetically predisposed to partying, but whatever the reason, scientists know just as much about enjoying themselves as they do about...well, everything else. But even if you don't have any scientist friends, you can still throw a smashing science party. We've got some brilliant party acccessories here at Gadget Inspector that we think would be perfect for a science-themed shindig. These terrific Test Tube Shots [no longer available] for example, will give you a fantastic way to serve up some drinks at your science party, as will the somewhat more colourful Test Tube Shooters. You can measure out your drinks with more precision than ever! Of course, we've got sciencey stuff that isn't related to drinking - the nifty Newton's Cradle is one example, demonstrating the laws of motion in a strangely appealing way that everyone can enjoy. Still, if it's a science party you're throwing, our super-scientific drinking accessories are all you'll need. It's time to don your lab coat, grab your goggles, and get ready for the best experiment ever! Gadget Alert! This week and this week only there's a flippin' good deal on the website. It's the kind of thing you'd love to have on your desk and fiddle with absent mindedly, whilst plugging away at those spreadsheets. It's a real corker and a real classic too! We are of course talking about the Newton's Cradle. If you don't know for-how it works, let us enlighten you. The cradle as seen below is a simple and elegant metal frame, with 5 metal balls dangling from an almost invisible line (Just have a look, you'll get it that way). 'But what does it do?' We hear you scream at the screen. Well, it's all to do with a man who lived a while ago. His name was Mr Isaac Newton. We're sure you're familiar with his laws of motion, but we'll break it down further. The 3rd law applies here (bear with us!). It states that every action has an equal and opposite reaction... so in simple terms, for everything that happens, something happens the other way! The Newton's cradle is the massively addictive example of this. Simply pull back one of the clackers and release. It'll hurtle towards it's neighbour and impact. The force will travel through alllllllll the balls and come out at the opposite end, in the form of the last ball flying outwards. A seesaw motion if you like! It'll click and clack back and fore, whilst the 3 balls in the middle sit perfectly still. If you pull back 2 balls? you guessed it. 2 will go flying at the other end, whilst the middle balls hangs like a lonely statue. 3 balls? The middle ball will go either way. Every action has an equal or opposite reaction. 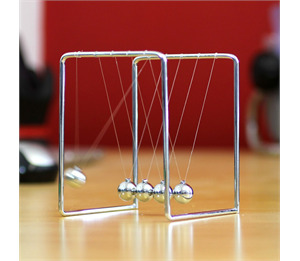 You will not find a simpler or more elegant gadget for you desktop than Isaac Newton's Balls. For such a crazy low price you can sit these in front of the monitor and start clackering away. We can't guarantee that you won't want to stop it by putting your fingers in between! They're reduced from an already low £6.95 to an even more astounding £2.90!